Nothing too special here. I came across some old vids I had taken a few years ago and figured I'd put them up. Before I started cutting the wires, I found the longest wire in the box and used it on the shortest distance. The left over piece became the new coil wire. The last couple vids show why I put new wires on the 510. 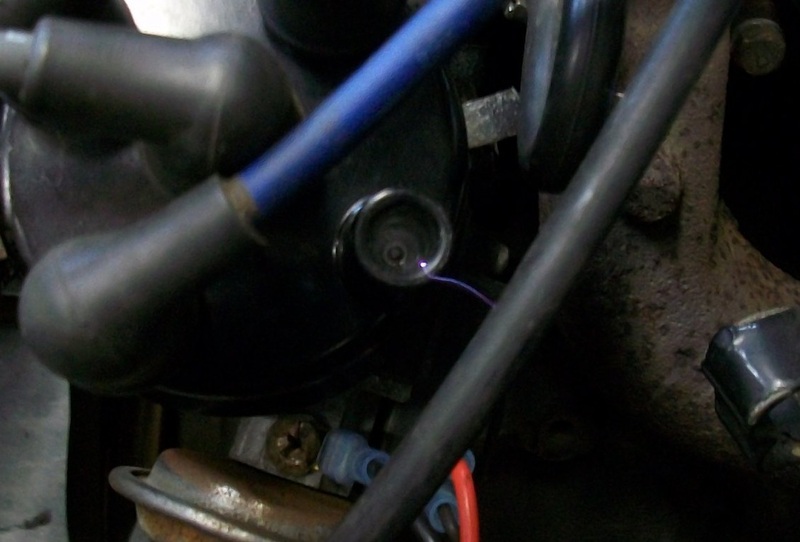 The dizzy is an electronic ignition unit, typically called a matchbox dizzy. Datsun guys will know what that means. The corresponding spark plug gap is .045", which isn't even 1/16". You can see in the vids that this dizzy has no trouble creating a spark!! Here's a pic for guys that can't view the vids. This is nothing compared to the arc in the second vid! !